If understanding how the brain works is biology’s “final frontier” and its toughest challenge then Dr. Karl Deisseroth is without a doubt one of its foremost contemporary explorers. He’s a psychiatrist, neuroscientist and bioengineer whose human compassion, experimental imagination and technological brilliance lie behind his invention, just in the last decade, of two of the most important new methods of learning about brain function. 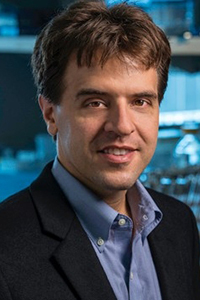 Boosted by a NARSAD Young Investigator Grant in 2005, Dr. Deisseroth invented a technology called optogenetics that is used today by thousands of neuroscientists in laboratories all over the world. With optogenetics, scientists can switch individually targeted brain cells on and off, one at a time, using colored beams of laser light and then observe the impact on behavior in living animals. The beams of light are transmitted into the brains of animals via the equivalent of fiber optic cables, thin as human hairs. Their ability to switch neurons on and off is the result of a genetic “trick”: inducing brain cells to express light-sensitive proteins found in species such as light-sensing microbes from lakes and ponds. If this sounds like science fiction, Dr. Deisseroth’s latest invention, called CLARITY, may be even more amazing. It enables scientists to see right through whole, intact brains by removing all the fatty molecules that hold the brain together and replacing them with a substance called hydrogel. Why do this? Because the fatty cells make the brain optically opaque so dense that until now it had to be cut into hundreds or thousands of razor-thin slices in order to see its detailed structures in even the most powerful microscopes. What do these amazing technologies enable scientists to do? By manipulating specific brain cells optogenetically, scientists are on the road to discovering how particular brain circuits work, and what happens when they do not work. CLARITY does something equally important in non-living brains, such as those collected in “brain banks” holding precious human brain samples. Their fully intact contents can be revealed and observed with perfect clarity, down to fine structures such as the dendrites, axons, and synapses connecting individual neurons one of the long-sought objectives of brain research and until now the stuff of fantasy. Dr. Deisseroth’s direct involvement in and empathy for the problems faced by his patients, most of whom have serious and persistent illnesses such as treatment-resistant major depression and schizophrenia, makes him a uniquely insightful and persuasive authority on the connection between patient-based clinical research and lab-based basic research. “It is really important to explain to Foundation (and NARSAD Grant) supporters how these two things relate to one another,” he says. “You could easily take the wrong lesson, for instance, from the two tracks of my work in mental health. I’m deeply committed to patients, yet it would be a serious mistake to insist that in the research we do, that we limit it to work that has immediate applications for those who suffer. It is possible to use optogenetics to manipulate the activity of specific neurons in mice which model various aspects of complex disorders like autism, anxiety, or depression. “But even if we had a way to control every neuron in the human brain which we don’t, yet we frankly would not know what to do in a clinical setting today. We absolutely must do the basic research: study the brain in its normal functioning and separately, and comparatively, in disease states,” Dr. Deisseroth says. “The brain is wonderfully, mysteriously complex. We have a lot of work to do. And I believe that patients know that. Family members know that. They know how devastating the symptoms are, but they also are painfully aware that the medications we have are problematic. They’re not specific enough. They have side effects. They are not effective enough.